Hello everyone!! I’m here today with CS Take It Make It Design Team for our December Challenge! 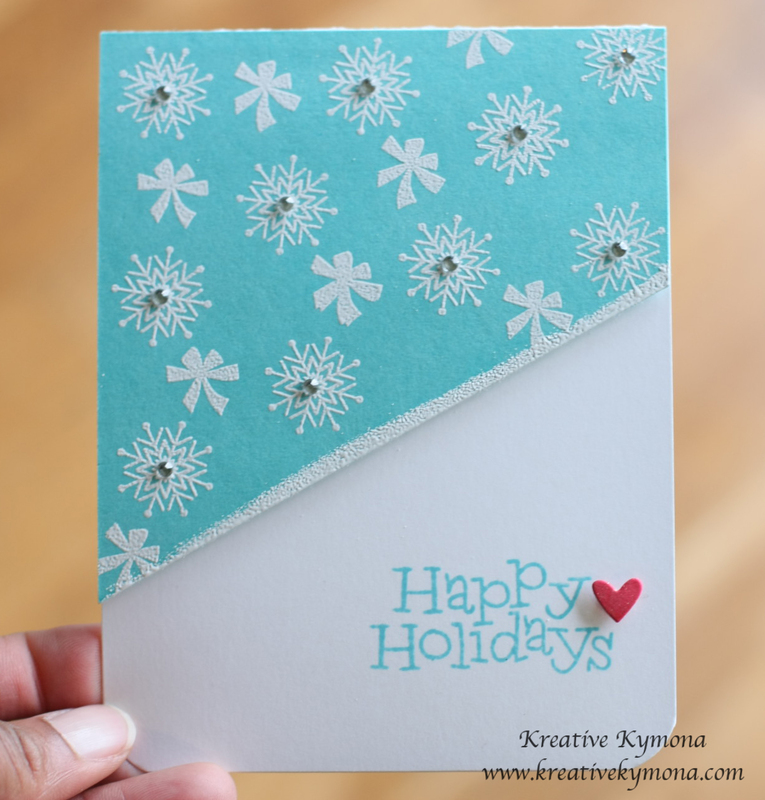 This month’s theme is White Stamping!! That could be white ink, white paint or white embossed stamped image. This technique is so pretty when its complete. I saw Kristina Werner create a card that had white embossing and I knew I had to give it a try. Isn’t this such a pretty technique! That white embossing on the blue is so pretty. That pop of red stands out. 1. I cut my Simon Says Stamp Audrey Blue cardstock on an angle and adhered it to my Neenah Solar 110lb White cardstock using foam adhesive. 2. I used Simon Says Stamp Presents and Ornaments to stamp my snowflakes and bows using Versamark ink. 3. I sprinkled Hero Arts Embossing Powder on my stamped images and heat set it. 4. I added versamark ink to the edge of the a Audrey blue cardstock, added white embossing powder and heat set it for added embossed dimension. 5. I stamped my sentiment using Simon Says Stamp Be Joyful stamp set with Simon Says Stamp Audrey Blue Ink. 6. I used my Copic marker R29 and colored a piece of white cardstock and die cut a heart using the smallest heart from Lawn Fawn Hearts Cuts. 7. I added Clear Wink of Stella to the heart and adhered the heart with foam adhesive. 8. I added Stampin’ Up! Rhinestones to the center of all of my snowflakes. Easy Peasy! What do you think? Let me know. You can stamp away to your hearts desire, using white ink, gesso or white paint. You can even stamp an image and then emboss with white embossing powder if you want to too!! To be clear, you CAN stamp in other colors too, but we need to see some parts of your project have clearly been stamped in white! We are delighted to be sponsored this month by Rubber Dance! Rubber Dance carry an amazing range of wonderful stamps, you really need to check them out if you haven’t already! The prize this month is a voucher to spend in the shop…..
PLUS:The Design Team will have a look at all your gorgeous work, and choose their Top Three….. and the overall Winner will get published in Craft Stamper magazine! Yes, the winning entry will appear in the UK’s number one stamping magazine! AND: The Challenge winner will be offered a Guest Designer spot for an upcoming challenge! So, £20 worth of rubber stamps, publication AND a guest DT slot? What are you waiting for? !